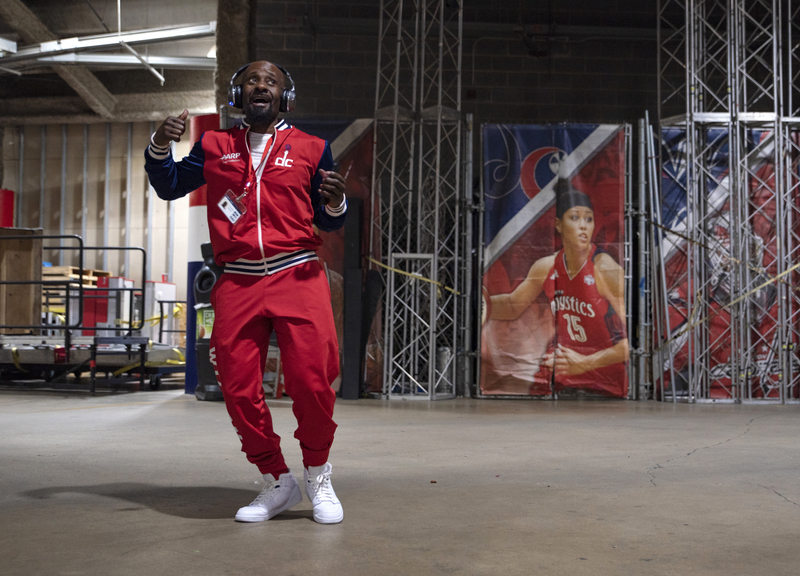 Wizdom dancers perform at the Capitol One Arena in Washington, D.C.
Wizdom dancer Christopher Johnson, 53, rehearses while the rest of the team gets ready in locker rooms before their second-to-last performance of the season. Johnson is a special needs educator when he's not dancing and says that music and dance have played an integral role in his life. 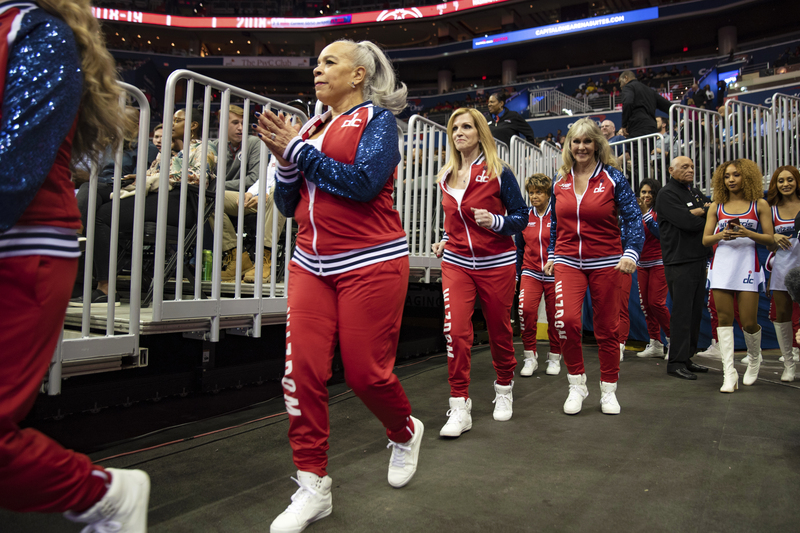 The "Wizdom" dance team, as the squad is called, first took the court for the Wizards in November and has performed at several home games since. 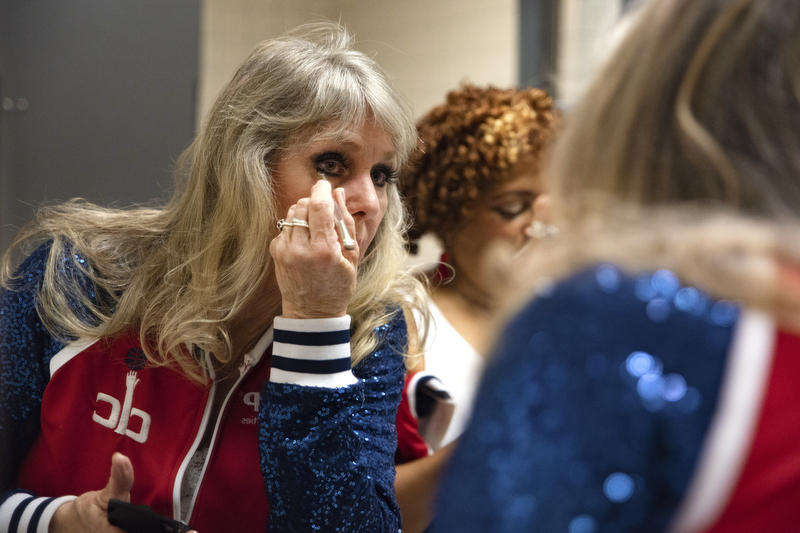 The 19 women and one man who make up the squad range in age from 50 to 76, and they include former NFL cheerleaders, a dentist, several grandmothers and a breast cancer survivor. "We are part of what I like to call the 'Fame,' 'Flashdance' and 'Let's Get Physical' generation," says Wizdom dancer Cindy Hardeman, 60. "We're just taking it into our elder years," she says, later adding, "If we were to top it in order of why we do it, I'd say fun, fun and fun." Wizdom dancers rehearse backstage before a performance at the Capitol One Arena. With contagious enthusiasm, team members are almost always dancing: in the locker room, walking to practice, lining up to perform. 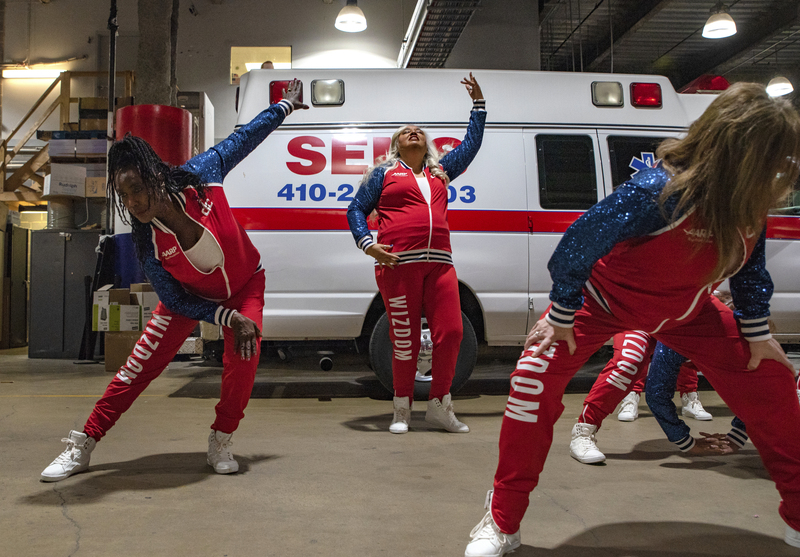 "They're very well-rehearsed, perform with a lot of energy, charisma, style, and are just entertaining to watch," says the team's choreographer, Derric Whitfield. "The audience can get behind them because they are so good. It's not just, 'Oh that was cute.' It's 'Wow they really can dance.'" More than 50 people tried out for the Wizdom — a rigorous audition process that was documented by the team's sponsor, the AARP. With their debut in November, they became one of at least a dozen other squads for dancers who are 50 or older in the NBA. By the time the season is over, Whitfield says, the team will have learned and performed seven routines in total. More than 50 people tried out for the Wizdom. By the time their season is over, the team will have learned and performed seven routines. Some who made the team tried out because they had performed as professional dancers or cheerleaders years ago and wanted to do so again. Some were looking for a way to get more exercise or were talked into it by their grandchildren. Wizdom members enter the floor of the Capitol One Arena. For others, the team has helped them to overcome hardships. "I was laying around having a pity party cause I lost my husband eight years ago and my mother two years ago and in between I had brain surgery," says one member of the team who asked to be identified, fittingly, as "Nana." At 76, she is the oldest member of the team. "This is really lifting my spirits," she says. "Nana," 76 (center), is the oldest member of Wizdom. Kristina Leach, 68, is another member of the Wizdom. A former cheerleader for Washington's NBA team, she lost her husband a few years ago. One year later, the restaurant where she worked for 40 years closed down. She says dancing for the Wizdom is the "best thing to happen to me." The 19 women and one man who make up the Wizdom range in age from 50 to 76. The team is extremely dedicated, Whitfield says. One member, for example, performed right after a prolonged nosebleed. Some have chronic health conditions but train together outside of the team's official weekly practices. "To our surprise we are able to do things we didn't think we could do," says Christopher Johnson, 53, the one male member of the team. "It's motivating us to even go further, to practice more, to be part of other dance classes." The Wizdom's last performance is on April 9. They'll all have to try out again next year if they want to rejoin the team. The group's last performance is on April 9. They'll all have to try out again next year if they want to rejoin the team. But members of the Wizdom say that won't keep them apart. They've already planned cookouts and pool parties for the off-season. As Nana puts it, the team has become a family. "We go through our aches and pains together," she says. Then she adds: "Anyone have Tylenol Extra Strength? Give me three!" 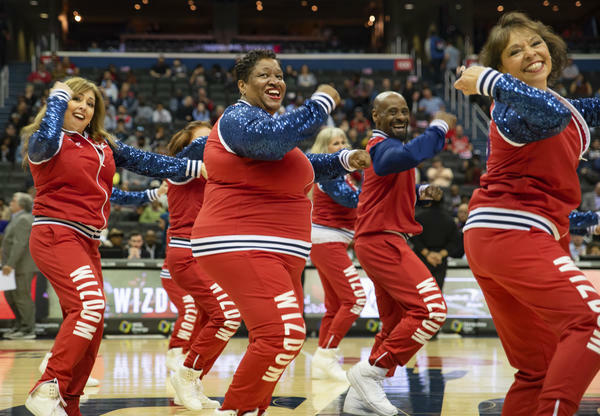 The Washington Wizards have a new dance squad this season - Wizdom. It's made up of performers 50 and older. 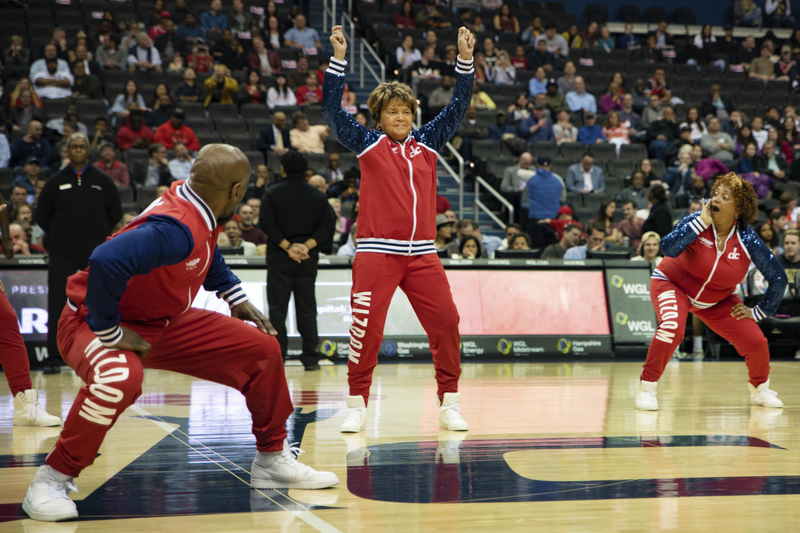 And it has been a hit at basketball games in Washington, D.C. NPR's Samantha Balaban caught their latest performance. SAMANTHA BALABAN, BYLINE: Christopher Johnson is a 53-year-old special education teacher. But right now he's dancing alone backstage at D.C.'s Capital One Arena next to some large industrial equipment and an ice resurfacer. Johnson is the only male dancer on Wizdom. He heard about the team last summer from his daughter but was reluctant to try out. Everyone in the ad looked old. CHRISTOPHER JOHNSON: Like real, real old. They looked old. And I was like, I don't want to be on the team. And they called us, like, at the senior citizens' team. I can't get it in my mind that I'm a senior citizen. BALABAN: But Johnson ended up being surprised. JOHNSON: It has been an unbelievable experience. And at this age, the energy level that I have and to be around people who share that and celebrate that - it's phenomenal. You know, many times, younger people are always celebrated, and old people are pushed aside. And so for once, the older people get the spotlight. DERRIC WITFIELD: All right, here we go - ready. BALABAN: The dancers gather to rehearse their routine a couple more times. BALABAN: About a dozen NBA teams have senior dance squads. Wizdom dances at home games about once a month. They have a new choreographed routine to learn for each performance. Some members are former cheerleaders. Some use sedans for professional sports teams. One is a bodybuilder. And some have never danced professionally in their lives. WITFIELD: Come in. OK, let's fix this diagonal. BALABAN: They might take a little longer to warm up and make more jokes about age-related pains than other dance troupes. But Derric Witfield, the team's choreographer, says, make no mistake. They're good. WITFIELD: They're very well-rehearsed. They perform with a lot of energy, a lot of charisma, a lot of style. They're just entertaining to watch. And people - the audience can just get behind them because they are so good. So it's not just, oh, that was cute. It's, wow. Like, they really can dance. And that's what we want. So I - you know, we push them to the limit in practice to really make sure that, you know, they perform as a professional dance team because they are. BALABAN: Witfield says 50 or 60 people tried out for the team, and it was hard to choose just 20. WITFIELD: They were all good. But, you know, it was important that we picked the right people - especially for the first year - who were passionate and dedicated and just wanted to do this and had a bigger reason for doing it than just the glitz and the glam. And that's, I think, what has made the team so successful. LENORA WILSON: I'm Lenora Wilson, known as Nana. I am 76. BALABAN: Nana is the oldest member of Wizdom. WILSON: And in my interview, initially, I said I just wanted them to be able to say, you go, Nana. BALABAN: A few years ago, she couldn't have imagined being here. WILSON: I was kind of laying around, having a pity party because I lost my husband eight years ago. And I lost my mother two years ago. And in between, I had brain surgery. So I had gone through a lot. But, anyway, then I got my new Wizdom family. BALABAN: Nana says it's been a blessing. WILSON: This has really lifted my spirits. It really has. And one thing we have in common - we go through our aches and pains together. Anybody have Tylenol Extra Strength? BALABAN: Then it's time. The dancers put on their sequined track jackets - red and blue - and line up courtside. UNIDENTIFIED ANNOUNCER: Ladies and gentlemen, please welcome to the court, the Wizdom. BALABAN: The dancers all have huge smiles. Their joy is infectious the whole time they're on the court. And for the finale, Christopher Johnson flawlessly executes a flip and a split, and then it's over. BALABAN: Sixty-five-year-old Wanda Newman bursts into tears. Wizdom is only performing one more time this season. And Newman, who is a recent-ish retiree, can't be there. NEWMAN: It's been a great ride (crying). BALABAN: Newman says she'll miss the camaraderie the most. But she and Nana, who are hugging each other backstage, already have plans for the dancers to stay in touch. WILSON: We're going to have a cookout at my place in May. We're going to have a pool party at someone else's house in July, so we're going to to keep this thing going. You know, we're going to just continue to stay together. And we're going to keep working on our moves so that we're ready for the next audition come September. NEWMAN: So we pray that we'll make the next audition. BALABAN: Wizdom will continue next year. It's been successful and warmly received by the fans. Nana, who will turn 77 soon, says even if she doesn't make the team next season, she's learned a valuable lesson. WILSON: ...And just try to spread the joy everywhere. BALABAN: Samantha Balaban, NPR News. PEACHES AND HERB: (Singing) Shake it, shake it. Shake your groove thing. Shake your groove thing, yeah, yeah. Transcript provided by NPR, Copyright NPR.